The above cartoon was in THE REALIST magazine, #61, August 1965. Georgia is in a drought and is about to declare war on the Army Corps of Engineers for not giving us our share of the water from the Chattahoochee River. And Alabama is mad at Georgia for hogging for not selling them water… tensions are building. I think the only thing we can do is bring Blackwater and Hallyburton Corporations down here to see that everybody that counts gets water. Now, the law makers are thinking of different solutions to save water but enforcing what they dream up is another matter, such as Don’t flush every time and put a brick in your water tank. Restaurants now only give your water if you ask for it. New York City Restaurants did the same during their shortage. 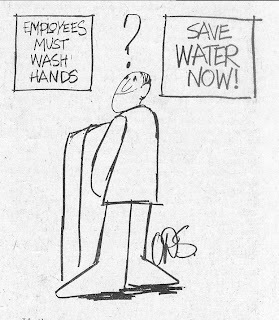 I remember in the 1960s New York City was having a water shortage which inspired the above cartoon. Also, the cartoon reminds me that in the late 1960s or early 70s Anna and went to New York City and one day we ate at a restaurant in Chinatown. During the time we were there I felt the need to use the restroom and the waitress directed me to it. It was a one commode restroom, no urinal. While I was standing over the commode doing my business an Asian man came in with an apron on, I think he was probably the cook. He looked at me, muttered something that I was not meant to understand, then pissed in the sink and rushed out. I don’t think he even washed his hands. I know I didn’t. I am not sure who didn't do their jobs... it may have been the state or it may have been the Corps of Engineers. I know the Corps of Engineers has control now.